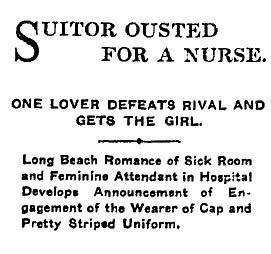 Elizabeth Mahler, a dainty brunette with a “sunny and jolly disposition,” is one of the bright spots at Long Beach Hospital. She had many male suitors and a few a months ago became engaged to a young man from Rialto whose last name was Kingman. In tending to the afflicted of Long Beach, however, she became well-acquainted with Lynn E. Babcock, the business partner of one of her patients, Jay Cooke. Although Mahler was already engaged, Babcock courted her ardently, provoking jealousy from her fiance. On Christmas, both men presented her with gifts and Kingman (who is not otherwise identified) insisted that she reject Babcock’s gift. Mahler refused and the engagement was broken. 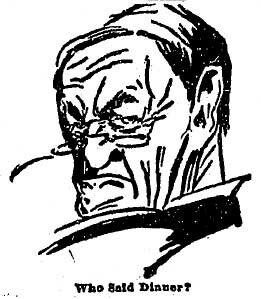 “This was Babcock’s opportunity and he was quick to ask Miss Mahler to become his wife, and was made happy by an acceptance. Miss Mahler sent in her resignation to the hospital and is now busy with her dressmaker preparing her trousseau,” The Times says. Some might end the story here with a rosy, romantic fadeout, but let’s check with Proquest. Oh my. The record is incomplete, but messy. Nine years later, there’s a nasty pair of divorce cases working their way through the Long Beach courts. Mrs. Fannie Wildrig accuses her husband, Henry, of extreme cruelty stemming from his infatuation with Mrs. Elizabeth Babcock. 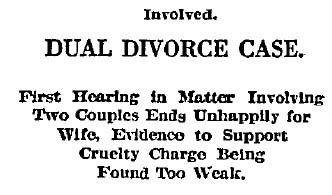 Mrs. Babcock, in the meantime, is accusing her husband, Lynn, of cruelty. Unfortunately, no further entries can be found. Such are the rewards and frustrations of research.